Over the next few weeks, you’ll hear a lot about setting financial and other goals. I doubt I’ll be the first (or the last) to ask what goals you have in mind for 2015. Obviously, setting goals and wanting to improve our lives are good things. But by focusing our attention in only one direction — the future — we’re missing an opportunity. What if we reversed the process? 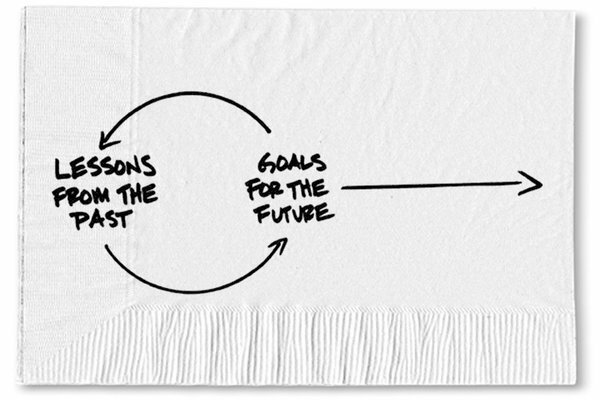 What if we revisit our 2014 goals first? For this exercise to work, we need to wear our no shame/no blame hats. It’s not about beating ourselves up but about learning what worked for us and what didn’t. We can also weigh our behavior and understand the emotions around our decisions. To start, look at the goals that just fell into place without much effort and compare them to ones that were a struggle. Do they share anything in common? Do we see certain behavior being repeated? Do some choices ignite good feelings, while others still give us heartburn? By revisiting our past goals and asking questions about what worked and what didn’t, we can accomplish a couple of objectives. 1) We avoid repeating mistakes. Perhaps there is a goal that goes on the list, year after year. Some goals are worth repeating, but here I’m referring to goals that never seem to get done. Looking back helps us identify goals that keep going onto the list but that always fail to get checked off. For instance, I often hear from people who say that they wish they could save a little more each month. The problem? They get to the end of the month and there’s nothing left to save. What if the order gets reversed? Instead of waiting until the end of the month, set up an automatic transfer. On the first day of each month, send some amount of money from checking to savings. Apply similar logic to other goals. What else can we do to turn good intentions into real action through automation, so we only have to think about it and commit to it once? 2) We learn what really matters to us. From experience, I know that we reach some goals faster than others. Yes, they may have been easier, but it also has something to do with how much we valued that goal. If we’re finding it difficult to complete certain goals, we need to look hard at why those goals are even on our list in the first place. Do we really want them there, or did we add them because we just think they should be on the list? A classic example is any goal that’s in the vein of keeping up with the Joneses –— having a house the same size as everyone else in town or not driving an old car. The goals we set should be about what matters to us not what matters to anyone else. Few of us set goals just to have a list. We set goals because we want to improve on who are and how we feel about ourselves today. If we choose to ignore what happened in the past, we’re only setting ourselves up to be disappointed in the future. 0 responses on "Featured Blog: Before Setting New Goals, Evaluate the Previous Ones"